Most people know Mac Barnett as an acclaimed children’s book author responsible for titles like Triangle and The Wolf, the Duck, and the Mouse. But his forthcoming memoir for young readers, Mac B. 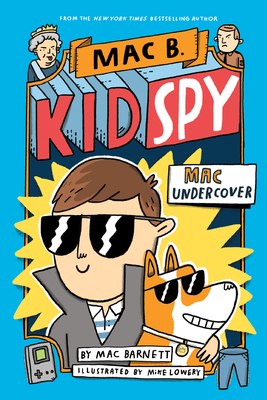 Kid Spy: Mac Undercover, divulges that he’s much more than that. The explosive revelation at the book’s center—that Barnett spied for the Queen of England as a child—is sure to set the literary world alight when the book is published this fall. We’re lucky enough to welcome Mr. Barnett to the shop on his memoir’s release date, September 11. In the meantime, slake your curiosity by reading our revealing Q&A with the international-superspy-turned-author below. Blue Willow Bookshop: Mac Barnett, welcome back to the blog. This is your first autobiographical work. What made you decide to tell your story? Mac Barnett: This book is full of top secret spy stuff: disguises, hand-to-hand combat, art heists, etc., etc.. When I was a kid, I was involved in a lot of high-stakes international intrigue. My stories were only recently declassified. Until now, I wasn’t allowed to tell them. BWB: The book has been hailed as “Funny as a crumpet. (But truly, secretly a hundred times smarter.)" As a former spy for England, you may be qualified to answer this question: How smart, exactly, is a crumpet? MB: Well, and I probably shouldn’t be telling you this but at the height of the Cold War, MI6, Britain’s spy agency, embarked on secret project: embedding microchips in the nooks and crannies of crumpets. The scheme was wildly successful. The crumpets were brilliant. In fact, in 1973, a crumpet beat chess master Boris Spassky in only seven moves. So “a hundred times smarter than a crumpet?” That’s a really nice thing to say about a book. BWB: Portions of your memoir have been redacted, we presume by top secret government forces. Were you prepared for that kind of censorship? MB: I figured it would happen. When you’re a spy, the good parts of your story are always redacted, and this book has lots of good parts. BWB: If not for your heroic efforts, the Mona Lisa may have been lost forever and the Crown Jewels would be spoonless. How gratifying is it for the public to finally learn of your role in saving these precious artifacts? BWB: What can readers expect in volume two? MB: King cobras, mini golf, a brief history of Restoration England. BWB: You’ve obviously worked closely with the Queen of England. Do you two still keep in touch? MB: When I was in ████████████████, I won twenty bucks by █████████████ a ████████████ for almost twelve hours.